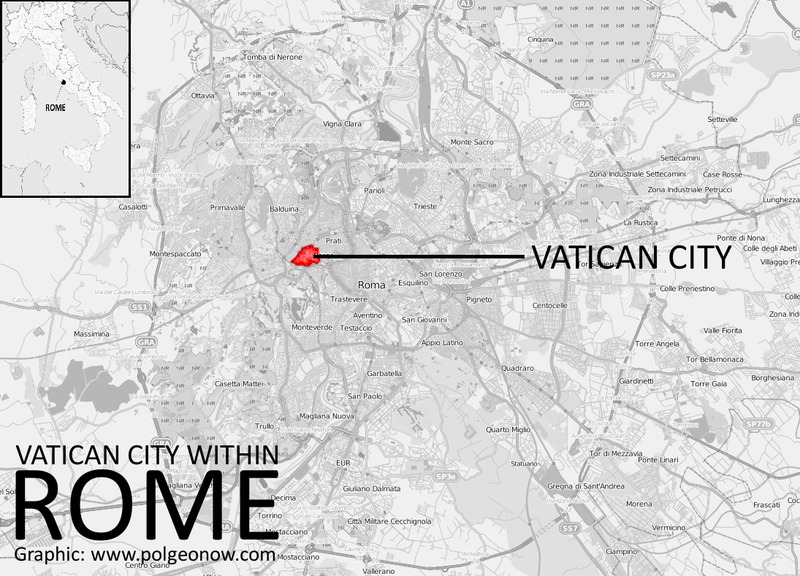 Is Vatican City really a country? Yes, technically. Although it doesn't really have the kind of population and national cultural identity we would often expect from a "country", it is recognized worldwide as a "sovereign state", which means it rules itself and answers to no one else. This makes it by far the world's smallest independent "country", at less than a quarter the size of the runner-up, Monaco. Vatican City's supreme leader is the Bishop of Rome, a.k.a. the Pope, who is also head of the worldwide Catholic Church. And not only is its independence undisputed by the international community, but it actually maintains diplomatic relations with the U.N. and many countries - sort of. Vatican diplomacy is conducted not in the name of Vatican City itself, but directly by the Catholic Church in the name of the "Holy See". 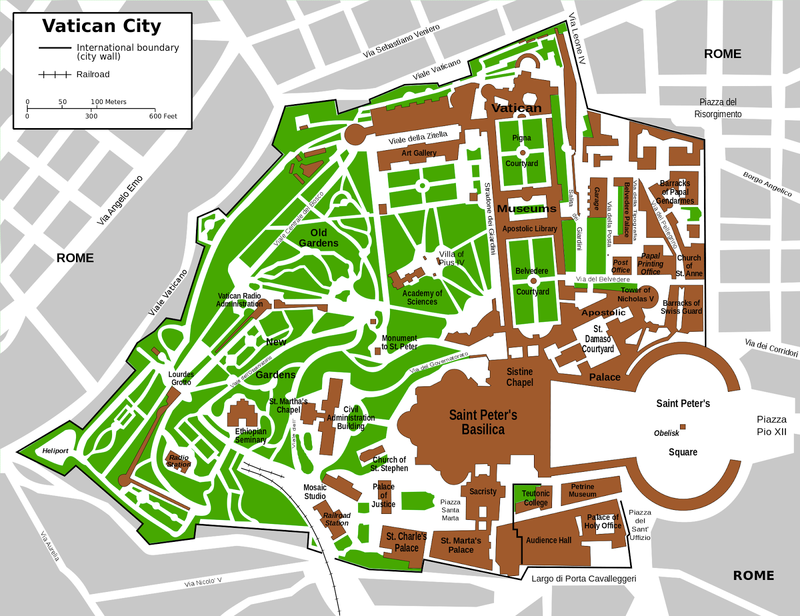 What's the difference between Vatican City and the Holy See? In short, Vatican City is a state (i.e. country), while the Holy See is a religious organization which happens to govern Vatican City, but has a broader purpose. In Catholic Church terminology, a "see" is the seat of authority of a particular bishop, and the "Holy See" refers to the authority of the Bishop of Rome (the Pope). So the Holy See is the religious authority presiding over Catholic churches all across Rome (and by extension, the entire Catholic world), but it has normal government authority only in Vatican City and its "extraterritorial properties". These properties, mostly churches or historical palaces located elsewhere in Rome, have a status similar to foreign embassies: they are technically part of Italy, but are under the legal jurisdiction of the Holy See. 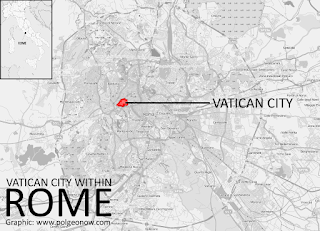 Vatican City's location within Rome (click to enlarge). By Evan Centanni. Background map by Dr. Blofeld. License: CC BY-SA; source). The term "the Vatican" can mean either Vatican City itself, or the Holy See, sort of like how "Washington" or "Beijing" can refer to the U.S. or Chinese governments rather than just the cities. 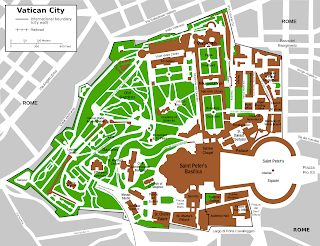 • Vatican City is the only undisputed country in the world which is not a member of the U.N. However, the Holy See does have status as a "permanent observer state" in the U.N. General Assembly. The only other U.N. observer state is Palestine, which just gained that status in November 2012. • Although Vatican City was created only in 1929, the Holy See has existed for many hundreds of years. It was often recognized as a "sovereign entity" even when it had no territory, though at many points in history it did control territories much larger than today's Vatican City. • The Holy See's official language is Latin, but Vatican City uses Italian as its state language. The Vatican's only military force, the Swiss Guard, gives orders in German. 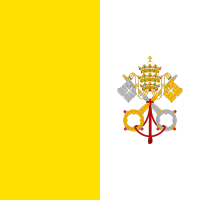 Graphic of the Vatican City flag is in the public domain (source).